Like any other collector of comic books, every now and then I like to sit down beside my collection and simply contemplate its grandeur. In my twenty five years collecting, I’ve amassed quite a number of extraordinary titles, many of which I share in this Tales from the Long Box column. Sometimes, on lazy, rainy Saturday mornings, I’ll pull out the thirteen (and growing) alphabetized and numerically ordained white cardboard long boxes, gaze at them with a cup of coffee or a glass of orange juice in my hand and start to thumb through the various titles, pulling out particular issues of fancy, studying the covers and, sometimes, actually opening the sealed plastic bags and rereading an issue of Batman from the 1960’s or a Green Lantern from the 1970’s or an Amethyst: Princess of Gemworld from the 1980’s. Sacrilege, I know. But it’s my collection and although I may be precious about it, it’s not so precious that it holds sway over my full enjoyment of it. I’m careful, of course, to keep that cup of coffee or that glass of orange juice a good fifteen feet away from my precious. I’ve accumulated a great number of titles in my time – each one of them a veritable jewel in the long box crown. Most I’ve bought. Some were gifts. A few were even traded for, back when I was much younger. As kids, we used to do such things in my neighbourhood, after picking up a Scalphunter at the local smoke shop – once we finished reading it, of course. Collecting comics wasn’t such a Howard Hughes delirium back then. It was a simpler time. My exquisite taste in periodicals was just forming in those early days, but I was still able to trade unfunny Cracked magazines for now classic issues of Frank Miller and David Mazzucchelli’s Daredevil. Quite the coup, if I do say so myself. It makes me wonder, then, how something as simple, as childish, as poor quality as G.I. Joe and the Transformers #1 ever made it into my long box collection. It wasn’t bought. It wasn’t given. And it certainly wasn’t traded for. Really, for all intensive purposes, my acquisition of this comic is a complete mystery. With the impending movies this summer to both sets of properties, I thought it might be interesting to flip though this issue’s pages and discover what it was all about. The story is quite simple. In a nutshell, Cobra seeks to take position of a solar-nuclear hybrid-power device which the forces of G.I. Joe are protecting. Optimus Prime, leader of the good natured Autobots, working on a hunch, wants to ensure the device does not fall into the hands of the evil Decepticons. Megatron, leader of the Decepticons, notices the Autobot interest in the technology and, thusly, attempts to steal it for himself. Battle ensues. The story itself would have been stronger had hilarity taken precedence over gun play. The script is a light white-wash of drama. Other than reading the names of your favourite characters such as General Hawk and Bumblebee and seeing their crude likeness drawn in a comic frame, there’s not much to keep the interest of the reader. Indeed, I only have the first issue of this four-issue mini-series in my collection. There may be mystery as to its appearance, but it’s no mystery as to why issues two through four are missing. G.I. Joe and the Transformers came out in early 1987. You could say that the two franchises had reached their height in popularity. The Transformers animated movie had just been released and Marvel’s fondly-remember G.I. Joe comic book series was in its fifth year of publication. Undoubtedly, there was an appetite from comicdom, but I’ll argue that the appetite for these two toy franchises was now at its zenith. These cross-pollinations tend to appear either at the height of awareness as a means to lure more money out of the pockets of collectors, or are a marketing ploy to garner interest in a slumbering product or a signal to stir up a waning interest. Not much effort was put into any part, story or art, of G.I. Joe and the Transformers and I wonder if this summer’s two impending films that carry the same names will have much more artistic vigor attached to them. I do know that I had much more vivid storytelling sessions, acting out scenarios with my collection of various G.I. and Transformer toys when I was a child. Rarely, if ever, did the two franchises commingle. Evan as a young boy, I knew that both universes were meant to be distinct from one another and that they should never, ever meet. The toys, looking back, were simple objects that compelled a child’s imagination to create story. The cartoons were devices that allowed for an expansion of that universe. The comics, I found, only occasionally aided this growth, however, the G.I. Joe series, published by Marvel, admittedly ran for over twelve years. The creators were doing something right on that title. Truth be told, I’m not certain what the writer and artist of G.I. 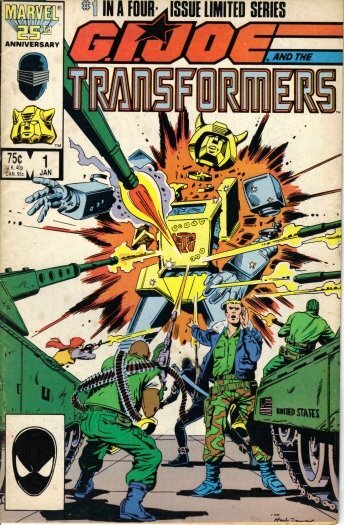 Joe and the Transformers went on to accomplish after the four issue series ended. I know I haven’t come across their names since, although, for some reason, Herb Trimpe rings an odd bell. Perhaps he’s in my memory the same way his comic is in my collection. It’s currently raining on a lazy Saturday morning in Toronto. I’ve got my cup of coffee in hand. Perhaps I’ll take a peek inside the long boxes once more and see what else surprises me.